“The Hunt” is a BBC series that showcases the lives of predators around the world. Several episodes have been nominated for prizes at the 2017 Jackson Hole Wildlife Film Festival taking place this week in Jackson, Wyoming. Mongabay caught up with series director Rob Sullivan to discuss his work on “The Hunt” – in particular an episode that explores the relationship between predators and humans. Predators are often depicted as the villains in films and other media. Even in wildlife documentaries, hunt scenes are often shot from the prey’s point of view and accompanied by sinister music as a leopard stalks her prey, making it easy to side with the seemingly hapless impala killed before your eyes. But predators perform very important roles in the natural world. They serve as population controls for prey species, weeding out old and sick individuals and making room for the next generation. In this, they reduce the chances an entire herd succumbs to disease, or that less-fit individuals pass along their genes and beget less-fit offspring. One series decided to take a concerted look at predators, their relationships to their prey, and the challenges they face in a changing world. The Hunt, produced for BBC Television and debuted on BBC One in November 2015, explores the lives of predators around the world from African wild dogs in Zambia to blue whales in California. In this series, the leopard v. impala scene is portrayed more from the perspective of the leopard. It takes the viewer along on the oh-so-careful and meticulous process that is hunting in the natural world – and inspires sympathetic disappointment when (spoiler alert) the impala somehow escapes after being subdued and dragged off by the hungry big cat. The last episode of the series, “Living with Predators,” explores their relationship with the most dangerous predator of them all – humans. And we learn about the efforts – and risks – some humans are taking to protect predators. Here, we watch as cheetahs from fragmented populations are translocated in South Africa to reduce inbreeding and human villages in India are relocated from forests where tigers still roam. We learn about how endangered African wild dogs are being tracked to save them from bushmeat snares. In one particularly dramatic scene, biologist Alexander Blanco nearly falls to his death while bringing a harpy eagle down from a nest in the Amazon rainforest canopy while studying the species’ ability to survive deforestation. Several episodes of The Hunt, including Living with Predators, were selected as finalists for the Best Conservation Film award in the 2017 Jackson Hole Wildlife Film Festival taking place this week in Jackson, Wyoming. Winners in this category and 24 others will be announced September 28. 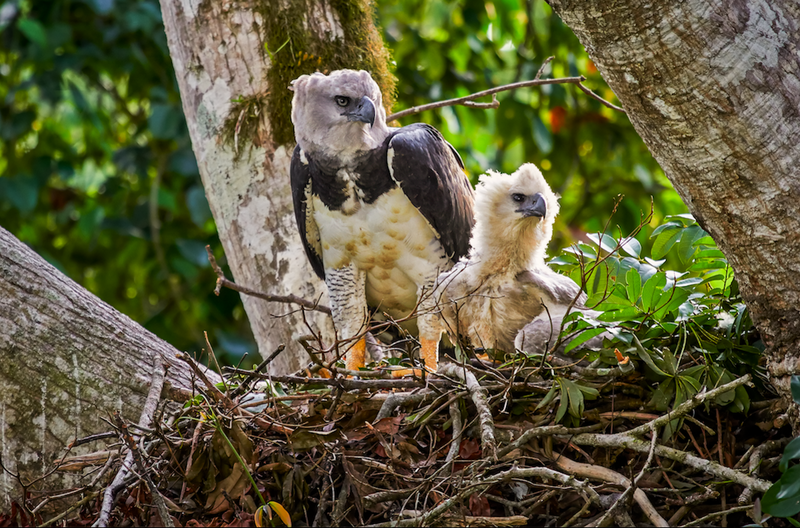 In an email interview, episode director Rob Sullivan talked about what it was like working on the series – including what happened when Dr. Alexander Blanco fell from the treetops while ferrying down a harpy eagle chick. 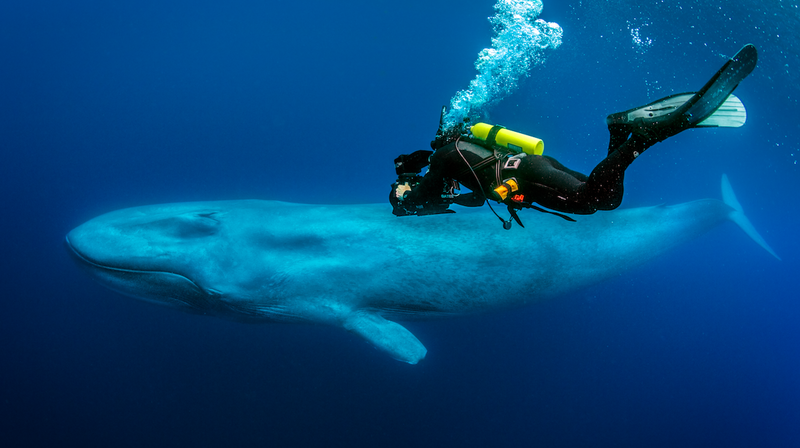 Image courtesy of Silverback Films/Richard Herman (Blue whale images were obtained under scientific research permit 16111 issued by National Marine Fisheries Service to John Calambokidis). What is your background and why did you make The Hunt: Living with Predators? Rob Sullivan: I’m a self-shooting producer director specialising in films about the relationship between people and the natural world. It’s rare to get an opportunity to tell conservation stories to a huge mainstream audience on BBC1 so I jumped at the chance. What was a highlight in making this film? What were the biggest challenges? Rob Sullivan: The highlight in making this film was getting to see so many amazing animals on one project – polar bears in the arctic, blue whales in the pacific, tigers in India. I don’t really have a “bucket list,” but if I did I would have knocked off half of it on this film. The stand out trip for me was visiting the Wild Dog project in Zambia, partly because it was run by very dynamic and dedicated Zambians, and also because the dogs themselves are so wonderful to watch. They really look after each other – the old and injured dogs always get a share of the food. And when they wake up from a group snooze they’re all so pleased to see each other again. The biggest editorial challenge was avoiding the doom and gloom factor: coming up with a balance of conservation stories that aren’t too depressing. The audience can be quick to change channels if they find something too downbeat. Another challenge was trying to end the series in a way that reflected and complemented the amazing bluechip [large-scale, high-budget] wildlife films, and not let down the quality too much! The biggest physical and emotional challenge was carrying Alexander Blanco out of the forest after his fall and dealing with his evacuation and treatment. In one scene, Dr. Alexander Blanco falls while repelling from a tree with a harpy eagle chick. How did that happen? When did you (or your team-members on-site) realize something had gone wrong, and what was the reaction on the ground? And how did the chick avoid injury completely when Dr. Blanco’s injuries were so severe? Rob Sullivan: Alexander’s fieldwork partner Don Blas made a mistake when rigging the ropes, so when Alex came to abseiling down, there was no brake on his descent. They’re very experienced climbers and have done it for twenty years, but they only climb on one rope so they can make a quick exit if they get attacked by a harpy eagle. I was filming Alex from a steel tower we had built opposite the nest and my college Adrian was shooting from below. Alex had a radio mic on and I could hear him screaming in my headphones as he fell. It still makes me shiver to think of it. After we carried him to the car, it was a very bumpy and painful five hour drive to the nearest hospital. Miraculously the Harpy Eagle chick landed next to Alexander, not underneath him when he ht the floor. I think she was flapping her wings as she went down which may have helped her stay above Alex. She spent the night in our camp happily eating bits of chicken while we took Alex to hospital and the team put her back on the nest the next day much to the relief of her eagle parents and us. Thankfully Alexander is also now back to his normal activities in the forest and has made a full recovery. Image courtesy of Silverback Films/Javier Mesa. During the segment on African wild dogs, there were some shots of animals caught in snares. Did you come across many of these while filmmaking? How did it shape your work (i.e., how do you balance inspiring awe in the natural world while revealing its sad truths)? Rob Sullivan: Yes we came across some snares on our Zambia shoot when we filmed with an anti-snare patrol and it was a relief to see them removed but frightening to think of how many are still out there. I’ve seen critically endangered macaques for sale as bushmeat in Indonesia. And critically endangered macaw chicks being smuggled in shopping baskets on buses in Guatemala. It feels good filming these moments because it’s so dramatic and allows the story to hit home. We can’t just pretend everything is beautiful and perfect in the natural world. What do you hope audiences take away from Living with Predators, and the series as a whole? Rob Sullivan: I think what’s so clever about the series is that we often end up rooting for the predators. Their life is so precarious and they often go hungry. It’s such a fine balance and such a brilliant simple idea for a series. With the final episode we add another even greater challenge into the mix for the world’s top predators – sharing a planet with people. If there’s one point to take away it’s that we’re all responsible on some level for whether these animals survive. Rob Sullivan: I’m working on another BBC series called “Rituals.” It’s very high-end obs doc [observational documentary] about the way people celebrate rituals around the world. My episode is called the Cycle of Life and we’ve filmed a birth in the Amazon, a courthsip festival in China, a Tuareg wedding in the Sahara, and funeral rituals in Indonesia and Japan. We’re in the edit right now and the series will be shown on BBC2 at the end of November. Banner image courtesy of Silverback Films.